In order to get a fibre map integrated into the larger AfTerFibre Map, you need will need to submit an annotated KML file. KML is a file format developed by Google that is used to display geographic data in a browser such as Google Earth, Google Maps, and Google Maps for mobile. KML uses a tag-based structure with nested elements and attributes and is based on the XML standard. Check out this KML tutorial for more information on it. 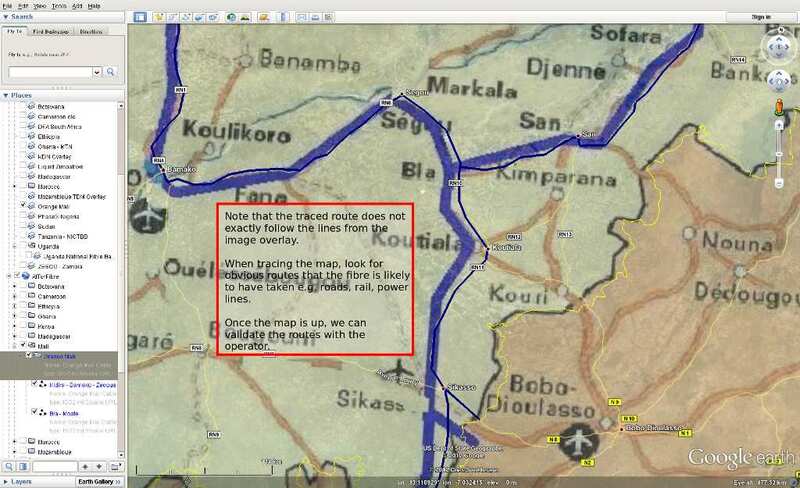 If you happen to already have a KML version of your map, skip down to the section on Annotating Your Map. Centre the Google Earth over the country you want to work on. This is not absolutely essential but it results in the imported image overlay starting out closer to where it is supposed to be in the end. 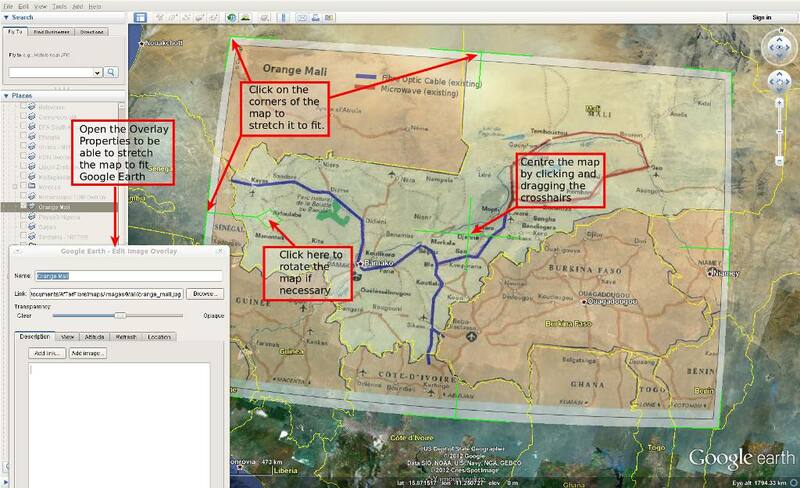 Import the map image in PNG or JPG format into Google Earth. To do this select the Image Overlay from the Add menu. See image at right. This will open a dialog box entitled New Image Overlay. Click on the Browse button to select the image file you wish to add. Once you have selected your file, you should see it appear in Google Earth. Before you click the OK button, give the overlay a sensible name in the Name field and then move the Transparency slider to about half way between Opaque and Clear. The reason for doing this is to make it easier to accurately overlay the image map over the Google Earth map. Click OK.
Now that your image has been imported into Google Earth, you will need to re-size it and stretch it to make the map in the image fit the Google Earth map. To achieve this, right click on the name you have given your image overlay and select Properties. This will re-open the same dialogue box that you used to insert the map. While the dialogue box is open you are free to move the map around. When the dialogue box is closed, the map is fixed in place. To stretch the map, you will need to use the green handles that appear on the image overlay. Use the cross-hairs in the middle to centre the map over the country and then use the green angles on the corners and green T lines on the sides to begin to stretch the map to fit. Look for major cities and national borders to align up. This is where the map transparency comes in handy. You may have to re-centre the map and stretch it a few times to get everything to match up. You can also use the green diamond at the left to rotate the map if necessary. See the image below for a practical example. Once your map is as close as you can get to aligned over the Google Earth map, you can click OK in the Properties window to close it and lock the overlay in place. Now you can begin to trace the map. 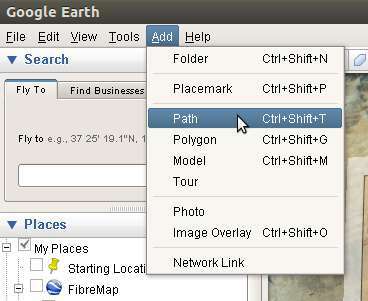 You will be using the Path utility in Google Earth which can be selected from the Add menu. This will open up a New Path dialogue box which should stay open while you create your path. This part of the mapping take a little getting used to. The first thing to consider is that you want to use as few lines as possible. Try to pick long contiguous stretches of the fibre that can be made in single line. This is not absolutely essential but it makes for less data to store. If the map has different cable phases of deployment. Try to do those separately. Thus you might have 3 or 4 paths to cover all the fibre for phase one and a few more for phase two, etc. So let’s started. Create a Folder in the left hand side of Google Earth for your map. Give it a sensible name e.g. Kenya Data Networks – National Fibre Network. You will put all of the paths you create in this folder. Zoom in to where you want to begin your path. Select Path from the Add menu. Give the path a name in the dialog box. I typically use the name of the city where the path begins followed by a hyphen and the name of the city where the path ends. Click on the Style/Colour tab of the dialogue box and select a colour for the path. For convenience sake, I tend to select a colour that matches whatever colour was chosen in the image overlay. Often colours differentiate cable deployment phases so this is visually handy. Also set the Width to 10.0. This makes it easier to see. Neither the colour nor width have an impact on the final AfTerFibre map. It is just to make the tracing more intuitive. Click on the city where you wish the path to begin. Start clicking along the path of the fibre indicated in the image overlay. Here is where it gets tricky and you will need to use your judgement. Often the overlay maps are approximate and in some cases completely stylized in terms of how they indicate where the cable actually goes. In order to improve (hopefully) the accuracy of the trace, look for clues as to where the cable is actually going. Most often cable deployments will follow some kind of major infrastructure. Most often roads but often railway lines or power lines. Roads and railway lines are relatively easy to see in Google Earth and you can use them as a guide for where the cable is actually going. Power lines for OGW fibre deployments are harder to spot. You can look for clearcutting in Google Earth which often indicates power lines but it may not be worth the effort. In that case, simply roughly indicating the route of the fibre is fine. We can ask the operator to validate this. Finally, you may be wondering how detailed to be. How many clicks, how closely should you follow the road’s twists and turns. My advice is not too closely unless you have a very high confidence level in the accuracy of the map. Otherwise a click every 10 kilometres or so should be good enough for now. Once you have finished your path, click OK to close the Property dialogue. Repeat as necessary until you have covered all the fibre paths on your map. 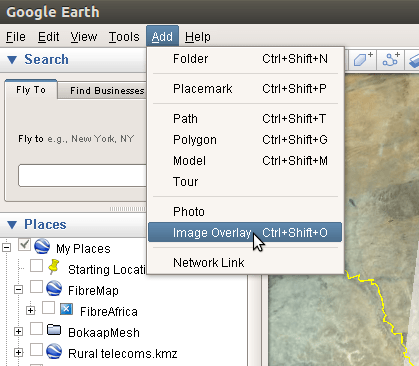 Make sure all the paths are contained with the folder that you have created on the left hand panel of Google Earth. The field names are a first pass at coming up with meaningful ways of describing a cable project. They will likely evolve as time goes on although we’ll try and make things as backwardly compatible as possible. Suggests are welcome for improving this fieldset. Select the folder you created in the left panel for the map. Name the file according to the name of the fibre project and save to disk.